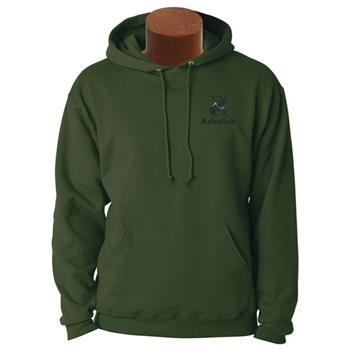 This JERZEES hooded sweatshirt is a 50/50 cotton/poly blend. It features double-needle stitched at stress points, a front pouch pocket, a two-ply hood with grommets and drawstring, concealed seams on cufs and a seamless body with set-in sleeves. "Knight" logo with "Relentless" embroidered on left chest.